In this entry I would like to bring up a topic that has nothing to do with my work as an illustrator. It's about illustrations alright, but these kind of illustrations haven't influenced my own work at all. To be honest, I couldn't make these kind of illustrations even if I wanted to. I just haven't got the skill. 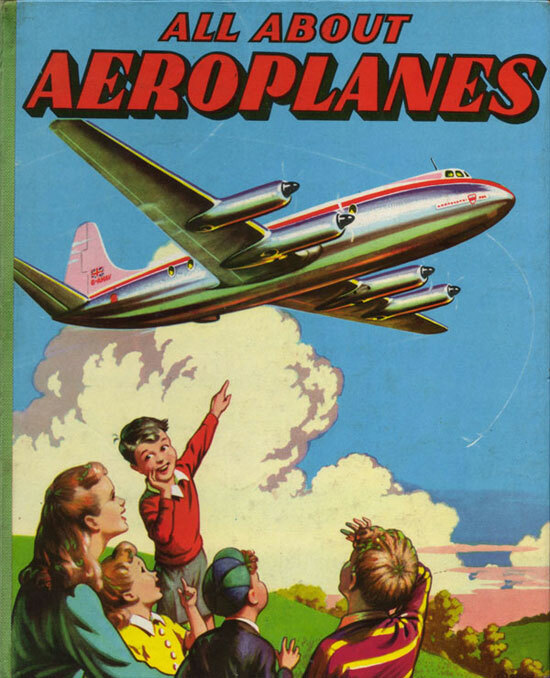 It's about aeroplanes too. 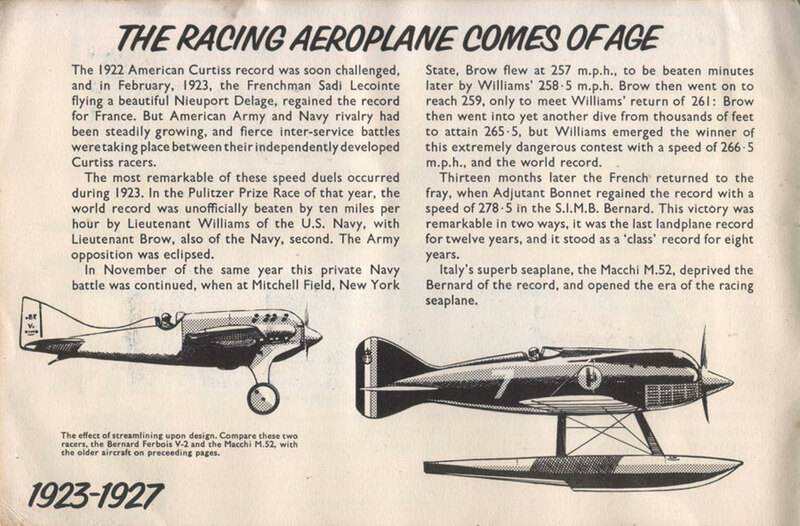 I like pictures of aeroplanes, especially aeroplanes made approximately between 1910 and 1960. So this entry of my weblog is strictly for my own - and hopefully yours too - visual enjoyment. I came up with the idea for this entry when my friend Frits Jonker send me a trading cards album. 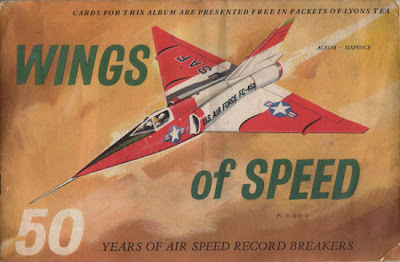 The album is called Wings of Speed, 50 years of air speed breakers and was produced in 1960 by J.Lyons & Company Limited, Cadby Hall, London W14. Maybe that doesn't ring a bell, but Lyons Tea surely will. One could collect the cards for this album by buying packets of this brand of tea. The album I got from Frits is almost complete, except for the very last card, which coincidentally pictures the very same aeroplane which is on the front of the cover, according to the underline. 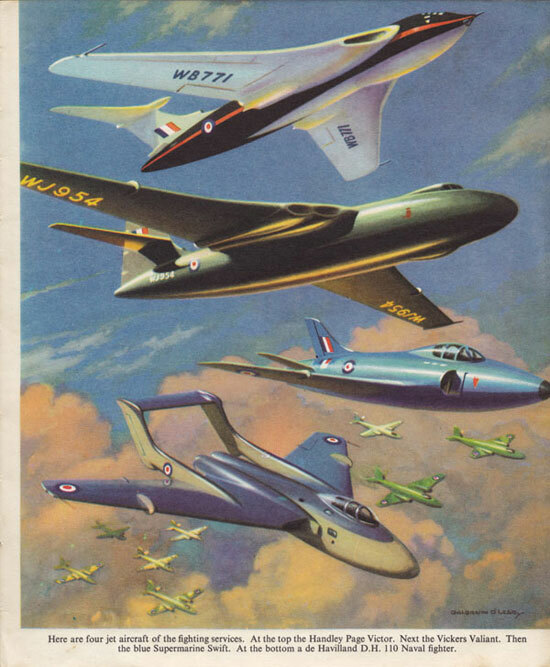 The album contains some very beautiful pictures of streamlined aeroplanes. The name of the artist is not credited in the album, but fortunately the artist was wise enough to sign the illustration on the cover. The style of the illustrations on the cards are very much alike to the one on the front cover, so one can safely assume that Mister Keane did all the colour illustrations in this album. I'm not sure about the black and white illustrations, but I wouldn't be surprised at all if he did those as well. 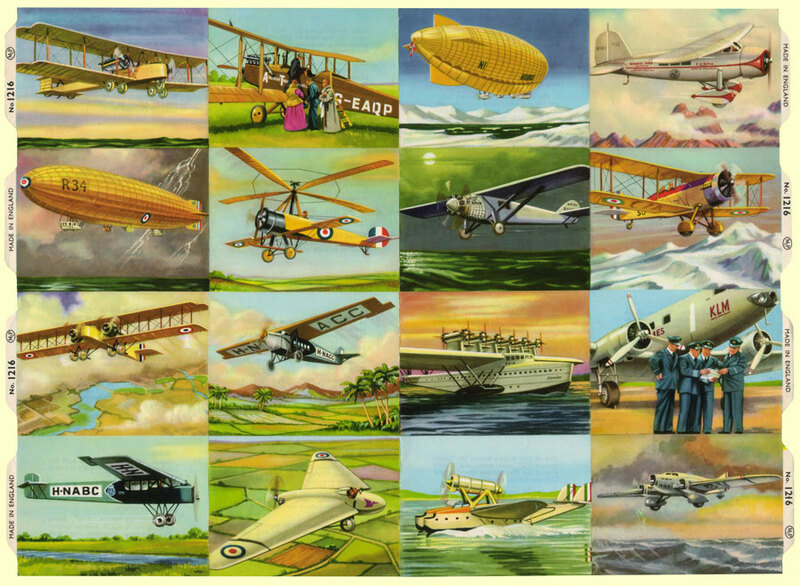 As you well can imagine, J.Lyons & Company Limited weren't the only ones who made trading cards with pictures of aeroplanes. In my collection of scraps of old paper are some trading cards which were manufactured by Lubro Beschuit, a Dutch company that made beschuit (Dutch rusk) somewhere in the mid-twentieth century. Alas, I only have a couple of Lubro Beschuit cards. I don't have the accompanying album Wat is dat voor een vliegtuig? (what kind of aeroplane is that?). So you'll have to do with just these few cards. I really don't know much about the picture you'll see below. 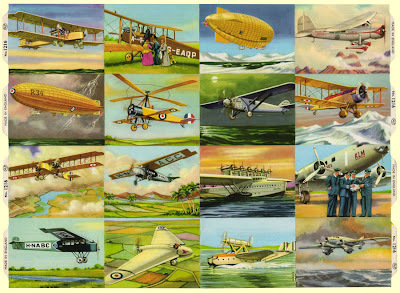 I bought this sheet with pictures of aircrafts in the 1980s along with four other sheets with the same topic, as well as some others with pictures of animals. I always thought that these picture sheets were reproductions, because they were absolutely mint when I bought them. The shop had quite a stock too. But besides that, nothing really indicates that they're reproductions. Everything about them looks authentic. The pictures are even embossed! That's quite an expensive way to make reproductions. So whilst preparing this blog I started to think maybe they're not reproductions at all, but old stock. I know, it sounds too good to be true. But then again, the 1980s were marvellous times for buying the most incredible vintage stuff from the mid-twentieth century for almost nothing. So maybe I'm right, or maybe I'm wrong. I guess I'll never know. You might wonder with what purpose these colour prints where manufactured. I'm afraid I don't know that either. The only clues to be found on the prints are a small logo and that they were made in England. The logo reads "MLP", but that's not much to go on. 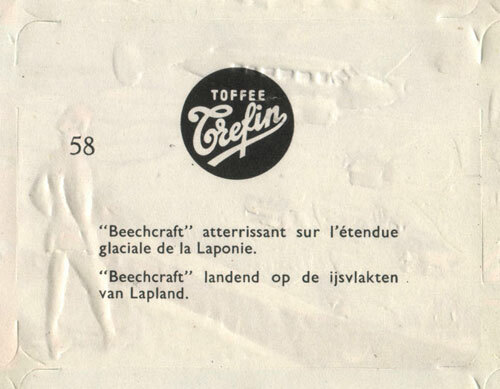 Some of the colour prints have the logo of Toffee Crefin, a Belgian candy manufacturer, on the back. So maybe these pictures were intended to be given away for free with the purchase of a Toffee Trefin product, just like the Lyons and Lubro trading cards. I don't know if Toffee Crefin also produced paste-in albums for these pictures. I couldn't find anything that would indicate they did. There are a lot of questions unanswered for, but that doesn't spoil the beauty of the pictures themselves at all! 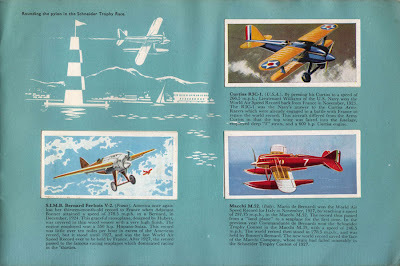 Beautiful pictures of aeroplanes are of course not only to be found on trading cards or similar prints, but also in books. I do love the children's book Airplanes, which is part of the famous Little Golden Books series. The book is written Ruth Mabee Lachman and the illustrations are done by Steele Savage. 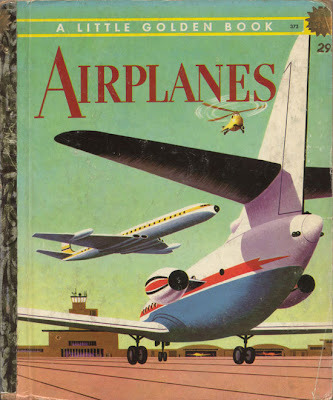 Mind you, this is the 1959 edition in which the pictures of the aeroplanes are updated to its time. The first edition was published in 1953 with illustrations by Lenora and Herbert Combes. Sadly enough I don't have that edition, so I can't make a comparison. 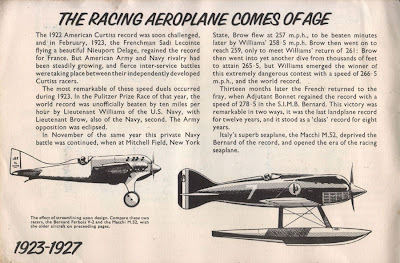 Another book with smashing illustrations is All About Aeroplanes. I bought this book whilst visiting Dear Old Blighty on a book market in Wells, Somerset. The book is written and illustrated by Galbraith O'Leary, who also made a wonderful book about British trains, titled British Trains. 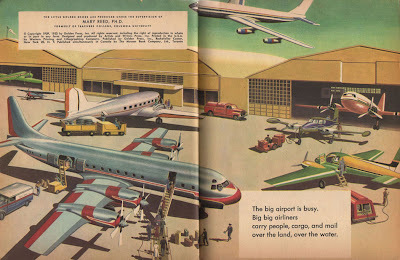 All About Airplanes is published by The Heirloom Library, London. The book is undated, but looking at the jet fighters, I would guess it was published somewhere between 1952 and 1957. 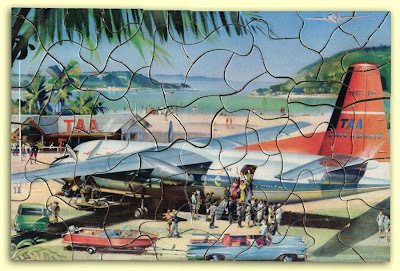 To conclude this entry I would like to show you this lovely jigsaw puzzle I got from my Australian friend Miike ( no misspelling there, that's how he writes his name). The jigsaw came without a box, so not a clue to any manufacturer or date. The only clue to its origin is in the abbreviation TAA, which stands for Trans Australian Airlines. But since I got this present from an Australian friend, that was already quite obvious. Of course these are just a few pictures from my collection. It's not my intention at all to give you a complete conspectus of illustrated aeroplanes. I just wanted to show you some pictures I get enthousiastic about. I hope you've enjoyed them too.